As I mentioned a while ago I had an evening of Heroquest gaming, and wanted to finish up as many Heroquest models as possible before that. Here are a couple of close ups of the chaos warriors and mummies. 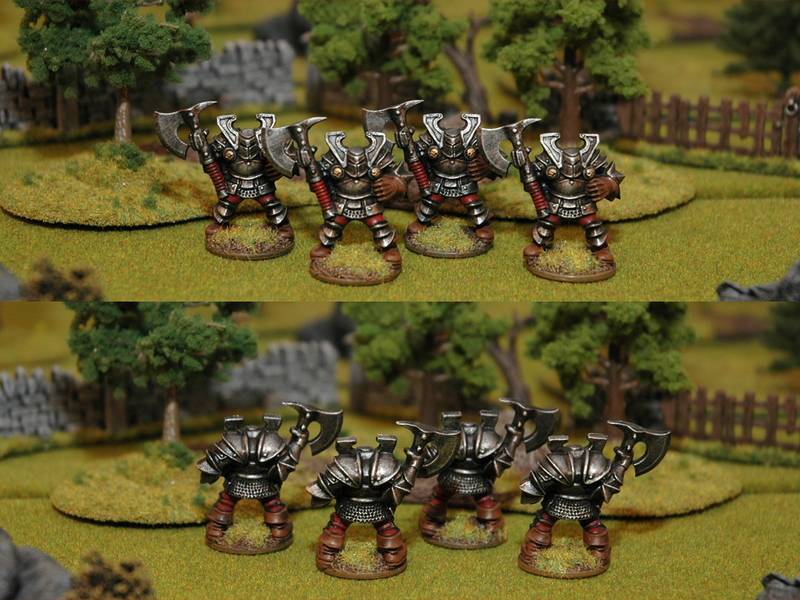 In the interest of fast completion, I didn’t use the actual Heroquest chaos warriors (as it would’ve involved cutting off the integral base) but instead painted up four rather similar 90s plastic chaos warriors. Once I have an otherwise full set of Heroquest models painted up, I’ll replace these with the proper models and do them in the signature coloured armour of the late 80s and early 90s. The mummies are proper Heroquest mummies though. Fastest paintjobs I’ve ever done, I think. They were spray primed Skull White, then base coated in Bleached Bone with the “flesh” parts picked out with Vallejo Cold Grey. I then drybrushed the wrappings with Skulle White. Once dry, the whole model was washed with Devlan Mud and the Cold Grey was highlighted by mixing in Dehneb Stone. They were finished in an evening, while I also did the base coats on the chaos warriors above. Highly unassuming models, but a great satisfaction to get some stuff painted really quickly! I will try to do a unit of the chaos warriors for my plastic Warhammer project before the end of the year. My painted total for 2013 is now 25. 10 more weeks, and less than 30 models to go. Will I make it? I highly doubt it, unless I resort to cheap tricks and underhanded tactics. That would be completely foreign to me. Forsooth. Here’s a photo of the zombies I had done since earlier. That’s all the currently painted stuff. 60 models or so to go for a full set of the base game + two expansions released in Swedish. Ah, lovely. That brings back some memories for me of playing Heroquest back in the day. Great work – especially on the warriors. Cheers Demi! You definitely should, your brushwork is great! Good speedy work. Nice choice of colours also. They look great, very solid. Getting a fast turaround also above a certain self-imposed minimum quality level is a satisfaction all of its own. Even if as a descriptor it doesnt exactly roll off the tongue. Which HQ figures are up next? Getting a HQ set finished before the end of the year would be sweet and very achievable. Plus those fimir need some love. Did you know that the rules for the game differ between the UK and US editions pretty significatly (I dont know which version the Swedish one is, but I suspect its the UK version)? The UK edition is a cakewalk, making the evil Wizard Morcars role a bit pointless. The US edition even renamed the Evil wizard, he is Zargon over there. I find that entertainingly bizarre. Thanks! “We deliver fast turnaround, also above a certain self-imposed minimum quality level” will be our company’s new pay-off. It’s quite catchy. First will be the gargoyle, he’s almost done. Next up are the fimir I’ve already started on. And a few Bob Olley goblins that I also got half painted for the HQ-evening. Those aren’t for the Hero Quest set though, just general Goblinovember, you know. In other news I finished my Harboth’s regiment of renown the other day. Final touches on the bases tonight and a few photos to prove they were done within the confines of the gregorian definition of Orctober. 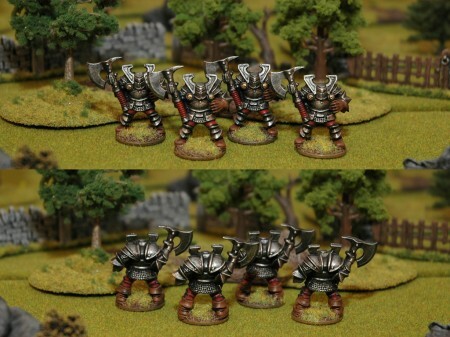 Dark elves by JollyBob Ghouls!